Today, the Florida East Coast Railway, LLC (FEC) unveiled its state-of-the-art Intermodal Container Transfer Facility (ICTF) at Port Everglades with a grand opening ceremony featuring an exclusive firsthand view of South Florida&apos;s new global gateway. “We are excited to open this state of the art facility to serve our customers and the community,” FEC President and Chief Executive Officer James Hertwig said during today’s event, which was attended by more than 200 community and business leaders statewide. Port Everglades Chief Executive & Port Director Steve Cernak credited the Broward County Board of Commissioners for having the foresight to approve the land purchase that facility is built on 17 years ago. “The ICTF ensures that Port Everglades remains competitive with other U.S. East Coast gateways, and, most importantly, it will give our port a cost and time-to-market advantage over many of these gateways, thereby putting more and more South Florida residents to work as a result of the additional business opportunities it will generate,” he said. The state-of-the-art 43-acre facility increases FEC’s available intermodal capacity from 100,000 to 450,000 lifts a year and the unique intermodal facility at Port Everglades will improve the transfer of both domestic and international containers between ships and rail. Currently, these containers must be drayed off-port to rail terminals such as the current 12-acre Andrews Avenue rail yard in Fort Lauderdale or to the Hialeah rail yard in Miami-Dade County. The FEC ICTF will allow the FEC to build 9,000-foot unit trains within the facility without blocking any city streets, and will allow cargo to move through Port Everglades to/from Atlanta and Charlotte in two days, and Nashville and Memphis in three days. FEC’s connections to Class 1 railroads CSX and Norfolk Southern allow for rail service to 70 percent of the U.S. population within four days. Additionally, having empty 53-foot domestic containers and trailers adjacent to the port provides more opportunities to trans-load import cargo from ocean containers to domestic containers for inland rail transport. This results in more domestic containers moving north as loads instead of empties, increasing the efficiency of the intermodal network. The ICTF is expected to reduce congestion on interstate highways and local roadways because loading and offloading cargo will take place at the Port as opposed to offsite facilities. As a result, air emissions will be reduced by diverting an estimated 180,000 trucks from the roads by the year 2027. The Florida East Coast Railway is a 351-mile freight rail line located along the east coast of Florida. It is the exclusive rail provider for Port Everglades, PortMiami and Port of Palm Beach. FEC connects to the national railroad network in Jacksonville, Florida, and provides carload and door-to-door intermodal solutions across North America to customers who demand cost-effective and premium quality service. For more information, visit fecrwy.com, email contact@fecrwy.com or 1-800-342-1131. Port Everglades is Florida’s leading container ports, handling more than 927,000 TEUs in 2013, serving as a gateway to Latin America, the Caribbean, Europe and Asia. Located in Fort Lauderdale, Hollywood and Dania Beach, Florida, Port Everglades is in the heart of one of the world’s largest consumer regions, including a constant flow of visitors and up to 110 million residents plus seasonal visitors within a 500-mile radius. Port Everglades has direct access to the interstate highway system and is closer to the Atlantic Shipping Lanes than any other Southeastern U.S. port. Ongoing capital improvements and expansion will ensure that Port Everglades can continue to handle future growth in container traffic. A world-class cargo handling facility, Port Everglades serves as an ideal point of entry and departure for products shipped around the world. More information about Broward County’s Port Everglades is available at porteverglades.net, emailing PortEvergladesCargo@broward.org or calling toll-free in the United States 1-800-421-0188. 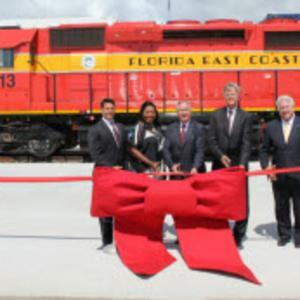 Opening the Florida East Coast Railway’s (FEC) new freight facility at Port Everglades are, from left: Florida Rep. George Moraitis, Jr., Broward County Mayor Barbara Sharief, FEC President and CEO Jim Hertwig, Port Everglades Chief Executive & Port Director Steven Cernak, and Florida Department of Transportation Assistant Secretary for Intermodal Systems Development Transportation Richard Biter.